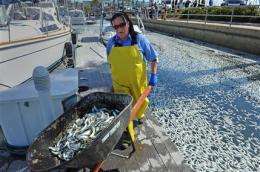 Crews from several coastal cities and more than 700 volunteers removed about 140 tons of dead sardines from King Harbor in Redondo Beach, city officials said in a statement. The fish were taken to a composting center where they will be turned into fertilizer. The city said that while the fish were gone, local crews will continue cleaning up the aftermath of the die-off in the harbor for another week. Biologists from the University of Southern California and the California Department of Fish and Game have said critically low oxygen levels in the water caused the sardines to suffocate. But the USC scientists said high levels of domoic acid were found in the sardines, which may have distressed them off the Los Angeles coastline and caused them to swim into the Redondo Beach marina. Fish and game officials also were testing fish for toxins at its animal forensics laboratory. Results were expected this week. Domoic acid is often found in the stomach of fish that have been feeding on plankton during toxic algae blooms, one of which was spotted off Redondo Beach on Wednesday. The toxin has been linked to neurological disorders, illnesses and deaths in seabirds, sea lions, sea otters and whales, spurring concerns for the gulls, pelicans and other sea life that have been feasting on the dead fish in King Harbor. The sardines died late Monday and caked the water's surface the next morning, stacking up to 2 feet deep in some spots.